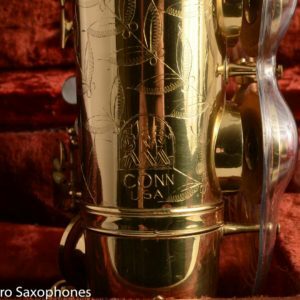 This Conn 12M, if it were a dog, would be a grey-muzzled golden retriever waiting for you on the porch. Its seen better days, sure, but it’s got a lot of life and a lot of love left to give. If it were a car, it’s an ancient Oldsmobile, with windows down and 8 track blaring on a summer day. Maybe the belt squeals a bit and maybe it takes a few cranks to start on a cold day, but its been doing that for years and its never let you down. 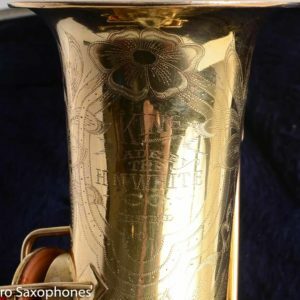 So yes, this 12M may be rather unsalubrious especially in the mighty company of a lot of the rare and special saxes here at GetASax, and perhaps some less scrupulous sellers might refer to it as a “player’s horn”, but I’m gonna tell you what it is: it’s kind of a beater. But it’s got some fight left, and by golly, it’s got tone to spare. 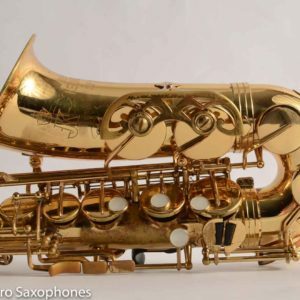 This sax has various and numerous dents, dings, resolders, and the neck looks like it got pulled down and possibly a bit sideways as well at some point. But it’s also got all its parts! And it’s mostly straight where its suppose to be, and mostly curved where its supposed to be. 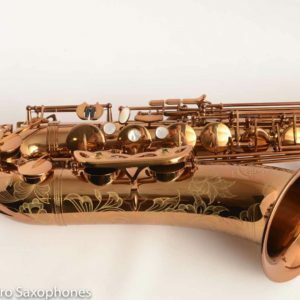 And it makes some saxophone noises- big ones. 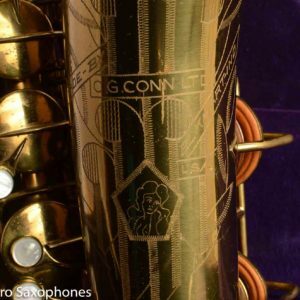 And it’s a freaking Conn 12M transitional and it sounds like one, at least down to low D or so because it needs some padwork. 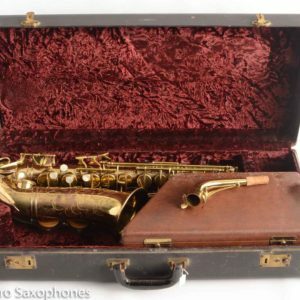 But its cheap, as far as vintage Conn baritones go, and even after some repairs to get it playable you’ll still be coming in at you-got-a-12m-transitional-for-what??? as far as total investment goes. 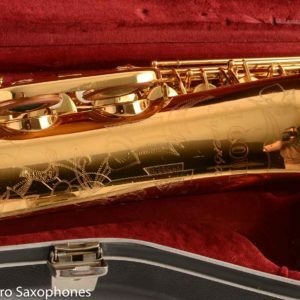 And have I mentioned its a Conn 12M transitional, just like Gerry Mulligan played? And like that grey-muzzled golden, it won’t even complain when you take it to the vet, because it’s been around long enough to know that means love. 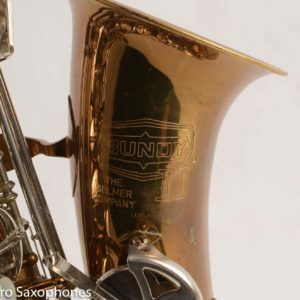 And that’s all this horn needs- someone to love it, someone to care, someone to play it. Because it’s got plenty of music left in it. 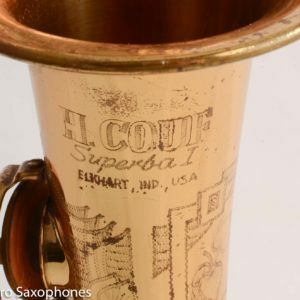 Super clean original silver plate Conn 6M VIII alto! It would be hard to find a nicer example of a rare silver plate 6M VIII. The VIII stamped Conns are the most desirable, and this one is in collectible condition. 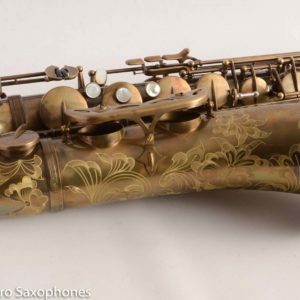 With a good overhaul and hand polish, it will look like a brand new saxophone, right off the shelf. 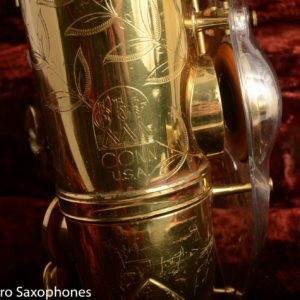 So if you know about vintage Conns, most of them are altos. Of the tenors, most of those are unlacquered, lacquered, or silver plate. Only a few are gold plate. 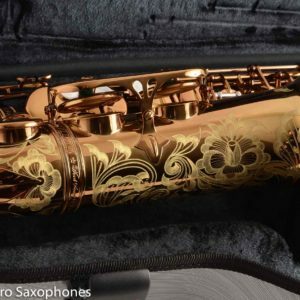 Of the gold plated ones, most are satin gold with normal engraving, and only a few have the thick burnished gold plate finish. And those special horns took way more time to manufacture, as the gold has to be hand-burnished onto the horn. They also got deluxe hand engraving with special portraits done by Conn’s best engravers. So this is one of those. It has all the boxes checked. Original burnished gold, portrait engraved, very good condition. On top of that, it has a recent, high-quality overhaul done with resotech flat metal resonators. The tone is big, wide, powerful, medium dark. 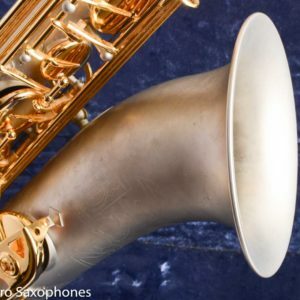 The horn vibrates under your fingers when you play. There’s not much to speak of by way of past repairs. The neck octave key has been resoldered, as have a few key cage legs. A few small dings were removed from the bell and back of the bow. These are all minor things and all corrected. 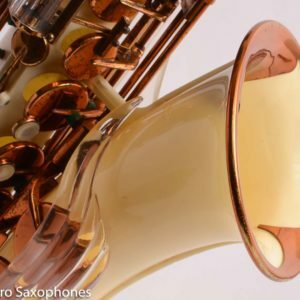 This horn is really nice. Even slightly nicer in person than in the photos. 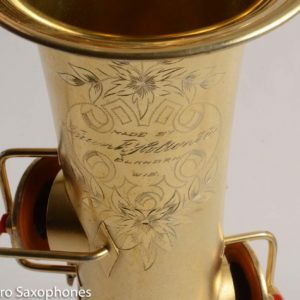 Couf Superba 1 Tenor Original Gold Plate Saxophone 68059 Matt Stohrer Overhaul One of the best ever!